Грануляторы серии SGF применимы для гранулирования и переработки пластиковых пленок. После плотного зажатия материала подающими роликами, плёнки толкаются и разрезаются на гранулы для повторного использования. Они имеют простое управление, отличное качество, разумную цену и компактные размеры. Плавная регулировка скорости вращения уменьшает пыль, шум и износ ножей. Различные виды устройств безопасности отвечают требованиям CE. Applicable to process extruded waste films, highly operation safety and compact design. Cutters with best cutting angle and adjustable rotating blades. Integrated material scrolling devices into one unit can facilitate the granulating work by easily scrolling the material into cutting chamber. React with assembly line or operated by specialized person. Attractive and compact design save more space. Width adjustable feeding inlet and thickness adjustor designs facilitate the different film granulating applications. 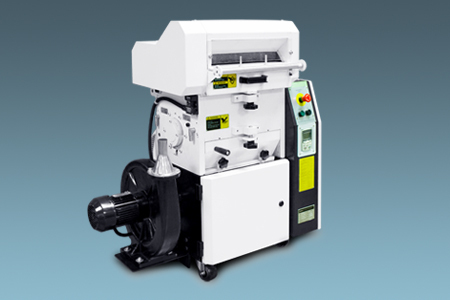 Scrolling motor has a frequency convertor to satisfy different film cutting capacity. Cutting chamber is equipped with a cooling water loop to effectively lower the temp.of the chamber so that improve working efficiency and avoid granule powder from melting up. 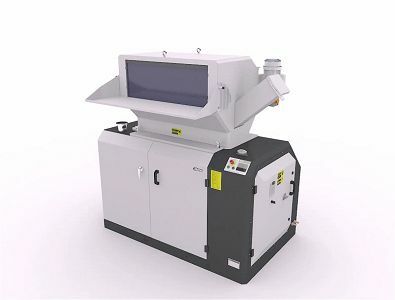 Equipped with cyclone dust collector, which can effectively separate regrinds and air and is also convenient for regrinds collection. Adjustable range of feeding speed 1.9~19m/min. Thickness range of material 0.5~6mm. Special screens with different diameters (Ф6、Ф10、Ф12mm) are optional.